Champions of intellectual property rights (IPR) say it is the driving force of economic growth and technological innovation. 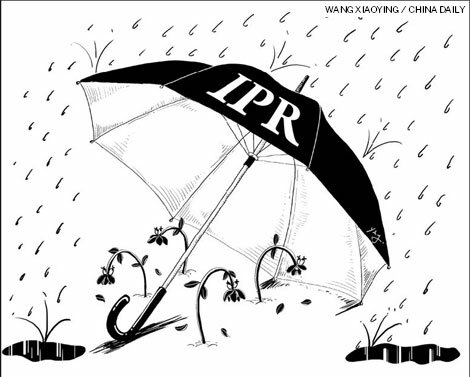 China has made its legislators perfect IPR laws ever since it decided to embrace market economy, and asked its law-enforcement agencies to ensure that they are properly implemented and protected. The country's increasing foreign trade has further strengthened this demand, and the government and judicial authorities have made great efforts to perfect the IPR system. China has enacted and implemented a series of laws and regulations on IPR protection and issued the Outline of the National Intellectual Property Strategy in 2008. Its judicial authorities at various levels continue to crack down on people and companies violating IPR. On the whole, the country has made considerable progress both in legislation and enforcement of IPR laws. But the purpose of an IPR system is not only to protect intellectual property, but also to encourage innovation, maintain social justice and thus promote comprehensive economic and social progress. The present tendency to lay undue emphasis on intellectual property both at home and abroad may go against the original intention of an IPR system. Some practices and disputes in the United States and other Western countries have taught a lesson to China, rather than being experiences worthy of emulation. The fundamental driving force of innovation is competition, while IPR protection in substance is a kind of monopoly. Monopoly can provide incentives for innovation, but it can also prompt former innovators to gain high return by relying on the products they have already innovated, rather than pushing them toward further innovation. Such a situation will ultimately weaken the power of technological innovation. Moreover, a stringent IPR protection system will encourage enterprises to take moral risks. To maintain their competitive edge, some enterprises can use a strict IPR system to set up barriers for their competitors. Some scholars describe the IPR disputes raised by developed countries against developing countries as "removing the ladder of development of developing countries". Enterprises in developed countries often erect trade barriers against their foreign competitors, especially those from developing countries, in the name of "infringement of intellectual property". Very stringent IPR protection laws can worsen the conditions needed for innovation. They can force innovators to focus less on further innovation, and more on "infringement". The patent project in the US is now subdivided. In the past, engineers used to apply for a patent on complete software. Now, nearly each code has a patent right. Apparently, such an approach helps protect the interests of inventors. But in reality, it greatly hinders technological innovation, because an engineer now has to ensure that he/she is not using a code in his/her new software that has been patented by someone else. People championing the cause of IPR say that the huge expenditure in the early days of technological innovation needs to be compensated by high returns now. What they do not realize is that by selling more products at a lower price they can recover the cost in relatively less time. In their economics paper, Perfectly Competitive Innovation, Michele Boldrin and David K. Levine argue that in many current and historical markets, innovation has thrived in the absence of copyrights, patents and other forms of monopoly power. They say that the presence of rents induced by government monopoly grants, intellectual property in the form of copyrights and patens may be socially undesirable, and that government grants of intellectual monopoly could lead to fewer innovations than under competition. Their conclusions may not be absolutely correct, but they can be used for reference. Developed countries have transformed their will into "international rules" through multilateral, regional and bilateral channels. They force developing countries to accept these "international rules" which usually are in favor of the West. Such tactics are given full expression in the disputes over formulation, passage and implementation of the World Trade Organization's Agreement on Trade-Related Aspects of Intellectual Property Rights. Another approach used by developed countries is to infiltrate the proceedings of developing countries' domestic legislation and strive to formulate laws and regulations in line with their interests, leading to imbalance in the legislative process of IPR in developing countries. After all, foreign institutions with abundant experience can easily gain the upper hand and are more likely to include their selfish motives into the seemingly reasonable proposals in the name of "international convention" in developing countries, which are busy mulling legislation in newly emerging industries. In such cases, legislators must ensure that the voices of other market players are fully reflected in the legislative process to guarantee impartiality in rules. Hence, neutral and objective Western observers should not label China's efforts to seek justice as "protectionism". Every coin has two sides. The system to protect IPR is no exception. Whether the system can be the driving force of innovation or turned into barriers impeding technological progress depends on whether we can get rid of the shackles of some presumptuous interest groups. The author is a research scholar with the Chinese Academy of International Trade and Economic Cooperation, affiliated to the Ministry of Commerce.